Babies are expensive, so being able to save money wherever possible is important, and printable coupons can be a lifesaver. Saving money is essential for most families in the current economy. Babies need a myriad of baby care stock items that can be expensive. Statistics show that diapers are a household staple for an average of 30 months during babyhood. At roughly $120 per month, diapers are a tangible expense. In addition, baby formula costs about $2,300 annually. It is time to save money with printable baby coupons. There are savings available for baby care items, diapers, and baby formula and food. Check out these ideas and start saving today. There are a variety of ways to obtain online coupons. Check out a specific brand's website for special coupon offers. These sites sometimes request that you register and sign up for their newsletter. They have printable offers as well as regularly emailed updates listing product specials. Huggies.com has a particularly generous number of coupons available. Diapers.com offers specials on all brands of diapers. Gerber.com and similac.com offer coupon savings by simply signing up for their newsletters. Once registered, money saving coupons will be emailed to your inbox. General baby care websites also offer links to many companies that offer special savings and coupons. Many online baby stores supply coupon codes that offer savings, everything from 20 percent off to free shipping. They also offer printable coupons to bring on your next shopping trip. Keep in mind that shopping for a baby is not just about diapers and formula; there is also the car seat, bedding, crib, toys and more. The full service online baby stores offer all of these items and much more with great coupon savings. Don't toss those oversized advertising envelopes that arrive in the mail. They contain valuable baby product coupons. As you register on a variety of baby care websites, request that the offers be mailed to you rather than printing them yourself. Many sites offer this option. Watch for coupons in magazines, especially family and child care oriented titles such as All You, Parents, Family Circle and more. 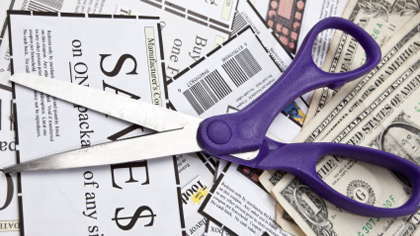 There are cut-out and rip-out style coupons to select and clip. Save them all. The coupon flyers found in the Sunday edition of local newspapers are filled with baby product coupons. There are offers for your favorite products plus new items to try. Be sure to clip and save all of them and decide if the product is appropriate for your baby once you check it out on your next shopping trip. Be sure to look inside the box or packaging of your favorite baby products. The manufacturer often prints coupon offers on the inside of the packaging to encourage repeat purchases. Be sure to check for coupons before recycling the box. There are many printable baby coupons to be had if you are inventive and search for them, online, in the postal mail, in magazines, newspapers and product packaging. It is time to save on all baby care essentials.